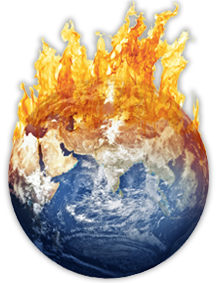 Global warming is caused by several things, which include man-made or anthropogenic causes, and global warming is also caused by natural causes. Natural causes are causes that are created by nature. One natural cause is a release of methane gas from arctic tundra and wetlands. Methane is a greenhouse gas and a very dangerous gas to our environment. A greenhouse gas is a gas that traps heat in the earth's atmosphere. Another natural cause is that the earth goes through a cycle of climate change. This climate change usually lasts about 40,000 years. Man-made causes probably do the most damage to our planet. There are many man-made causes of global warming. Pollution is one of the biggest man-made problems. Pollution comes in many shapes and sizes. Burning fossil fuels is one thing that causes pollution. Fossil fuels are fuels made of organic matter such as coal, or oil. When fossil fuels are burned they give off a green house gas called CO2. Also, mining coal and oil allows methane to escape. How does it escape? Methane is naturally in the ground. When coal or oil is mined you have to dig up the earth a little bit. When you dig up the fossil fuels you dig up the methane as well letting it escape into the atmosphere. Another major man-made cause of Global Warming is population. More people means more food, and more methods of transportation. That means more methane because there will be more burning of fossil fuels (if you're into gas burning cars like our planet is), and more agriculture. If you've been in a barn filled with animals and you smelled something terrible, you were smelling methane. Another source of methane is manure. Because more food is needed to feed the population we have to raise food. Animals like cows are a source of food which means more manure and hence more methane. 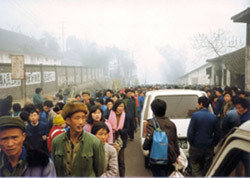 Another problem with the increasing population is transportation. More people means more cars, and more cars means more pollution. Also, many people have more than one car. There are definitely ways of raising animals and farming that use no manure and no methane. Once we realized the problem we should have stopped immediately using manure. Instead we choose to continue killing the planet. We are a very stubborn race. Since CO2 contributes to global warming, the increase in population makes the problem worse because we breathe out CO2. Also, the trees that convert our CO2 to oxygen are being cut down because we're using the land that we cut the trees down from as property for our homes and buildings. We are not replacing the trees (trees are a very important part of our eco-system), so we are constantly taking advantage of our natural resources and giving nothing back in return.